That is what one family member’s response was when someone recommended them to counsel with us about their relationship issues. When I relayed the comment to my husband, he laughed. In fact, we both did. Perfect? Not at all. Happy? Most of the time. My husband and I have been married for 13 years now. During those years, I have learned what makes our marriage happy — and what doesn’t. I have learned what helps us get through difficult times and still come out holding hands as well as each other’s heart. “Mommy, who is your best friend?” my daughter asked me yesterday. He’s the one with whom I share my deepest thoughts. He’s the one that holds me when I cry and no one else sees my tears. He’s the one that held my hand while I brought six kids into this world. He was there when I mourned the loss of four unborn babies. He held me as I violently sobbed for my close friend who lost her husband in a tragic car crash. He’s the one that gave me a birthday card when I had been a Christian for one year. Yep. That’s my best friend. How did he become my best friend? It’s not always easy loving and cultivating a marriage when two human beings are involved. We all fall short and mess-up frequently. We live in fallen bodies, and in a fallen world. How can we make a marriage work? Seek God first. This is definitely the most imperative component of a happy marriage. Without God, we are nothing. Seeking God first helps me love my husband the way God does. Yes, he has imperfections, but God helps me look upon his imperfections with love — instead of disdain. When I seek God, I desire to please Him in all I do — even in my marriage. God tells my to reverence, obey and love my husband. When I follow God’s teachings, my marriage only gets better! Don’t criticize. A wise wife will build up her hubby instead of tear him down. Men desire to be admired and praised. I want my husband to receive most of his praise from me — not someone else. I want him to know that he is the best-looking, smartest, most talented man in the universe! How can I say these things and truly mean them? I don’t criticize him in my heart. I see the good in him and focus on that. Follow the leader. When my husband makes a decision, I have learned it’s best to just follow his leadership. Questioning his decisions only adds more stress to a marriage that already has to endure some bumpy days and trials. God takes care of me when I follow my husband — and our marriage only gets better as a result! Date often. Whether it’s a hot cocoa and movie date in your bedroom or a fun night on the town, make time for dates. The more often, the better. We have six kids in our family, and finding time for a date can be tough — but we do. We probably date once or twice a week. Just today we had a lunch date at home. We put the kids down for a nap and had our own date to reconnect and discuss some issues. Dates are important because it makes both you and your husband take time to re-focus on your marriage. Work, kids, church, friends and extracurricular activities can all consume your time and energy. Don’t give so much away that you never have time to cultivate the most important human relationship you have — your marriage! Touch often. A couple that doesn’t touch often has many underlying issues. Why not kiss your husband often and welcome his embrace? Even when when I am feeling under the weather, I still try to show my husband physical affection. When we turn our husband’s advances away, we are sending signals that we do not find him attractive or desirable. Though we may not think we feel that is the precise message our husbands are receiving. A marriage that is full of hugs, kisses, hand-holding and intimacy is a marriage that is healthy and alive! Marriages will never be perfect, but they can be happy. 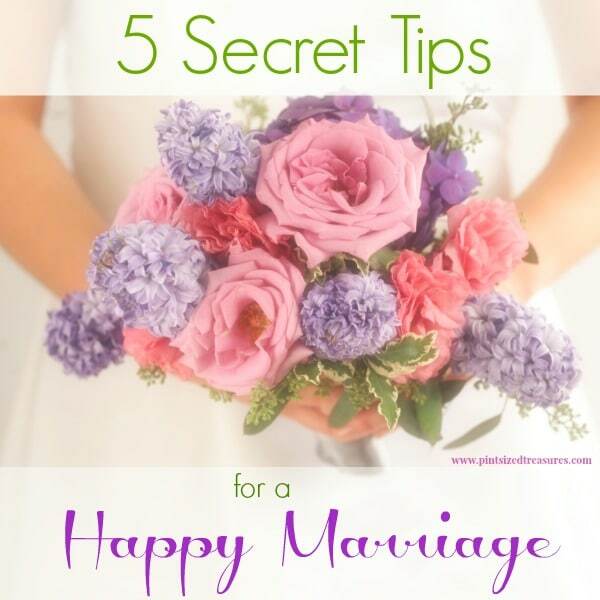 Try these secret tips to change your marriage into a happy one!